As the international development community gathered in Brussels last week for the European Commission’s annual European Development Days, a shadow hung over international attempts to tackle one of the world’s most pressing, if not the most pressing, development challenge: the global fight against climate change and toxic greenhouse gas emissions. The battle to reduce emissions and provide access to sustainable energy for all on our planet cannot be seen solely as a climate change issue. It is at the forefront of global development policy and remains critical to tackling poverty, disease, inequality and instability across the world. Sustainable Development Goal 7 — the international development community’s commitment to providing universal access to modern, reliable, affordable and sustainable energy sources by 2030 — provides an opportunity to deliver huge socioeconomic benefits for developing communities and promote long-term sustainable development. The impending withdrawal of the United States from the historic Paris climate agreement must not be an excuse for the collective will of the international community to falter. Yet neither should the scale of the challenge be underestimated. 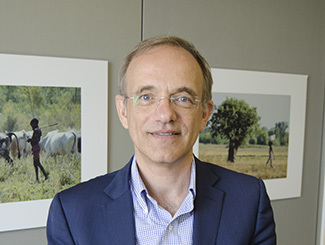 According to the International Energy Agency, current trends predict more than half a billion people will still lack access to electricity in sub-Saharan Africa in 2040, directly impacting the ability of developing countries to industrialize without having to rely on coal extractives, unlike their richer Western counterparts. Moreover, the number of people globally relying on polluting fuels and technologies has increased since 2010 to an estimated 3 billion. To achieve SDG 7, the global community must radically rethink existing models. Governments, communities and the private sector must together expand infrastructures, upgrade technologies and provide the resources, leadership and support necessary for communities to take the lead and ensure people can access sustainable energy sources wherever they are. Such a goal is firmly within our grasp. Renewable energies are becoming cheaper, with large-scale solar plants now able to produce cheaper power than fossil and nuclear power in many countries. Solar and wind industries are creating jobs 12 times faster than the rest of the U.S. economy, while the number of jobs in renewables worldwide continues to rise. Even in hard-to-reach areas, off-grid options enable communities to access energy through mini-grids and individual household solutions. The pay-go solar market — which brings together solar, storage and mobile pay technologies — provides an affordable option for electricity and is gathering pace in many African countries. India last year set out nearly $3 billion in state funding for developing its solar panel manufacturing infrastructure, backed by more than $100 billion commitments from global investors. National governments, international institutions and the private sector all have a role to play in working toward SDG 7 and building on these foundations. Yet it is communities that hold the key to success, and it is communities around the globe that must be placed at the heart of efforts for sustainable solutions. Organizations can effectively contribute to local community development through establishing renewable energy systems focused on sustainable agricultural practices. Using existing community structures to facilitate wider development objectives allows organizations to introduce and manage new technologies to promote both community ownership and sustainable sources of energy. 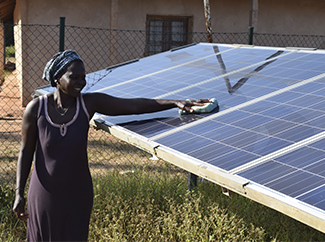 Rather than imposing foreign processes and new approaches on hard-to-reach communities, extensive community engagement provides the basis for scaling up and replicating the project to reach other communities, empowering locals to take the lead on sustainable development and renewable off-grid energy systems. The results speak for themselves. 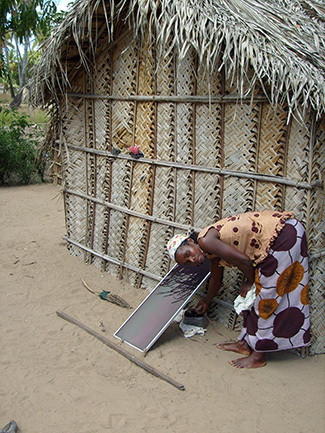 In the Bissora Sector of Oio Region in Guinea Bissau, off-grid solar-powered house systems were installed and implanted by ADPP Guinea Bissau in 51 community facilities alongside 39 solar-powered water pumps. They reached 15,000 people by powering homes, community centers, schools, health centers and mosques. By employing this model, organizations can achieve wide-reaching success and positive gains for local communities, including a significant reduction in women’s workloads, increased sense of community cohesion, particularly for young people, and opportunities for educational activities at times that do not interfere with agricultural or other activities. This not only facilitates access to sustainable energy sources, but also supports the attainment of the wider Sustainable Development Goals. The global outlook may appear volatile and uncertain. But whatever the machinations of international politics, it is through community-based approaches and empowerment that we can ensure the international development community stays focused and committed to delivering a world with access to modern, reliable, affordable and sustainable energy for all.